Dan has been an auto mechanic, truck driver, engineer, and many other things. First, I must warn you. To change this clutch, you must pull the engine. As bad as that sounds, trying to do this without pulling the engine is worse! Trust me—I tried it! You don't want to go here. Honestly, pulling the engine is easier than it sounds and seems to be what the engineers who built this truck had in mind. 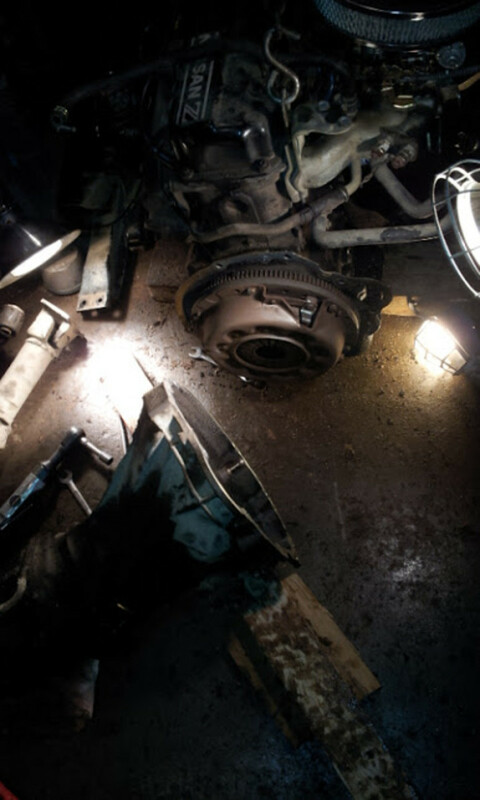 This guide will walk you through what I went through—after I pulled everything else to try to reach the clutch through the transmission. 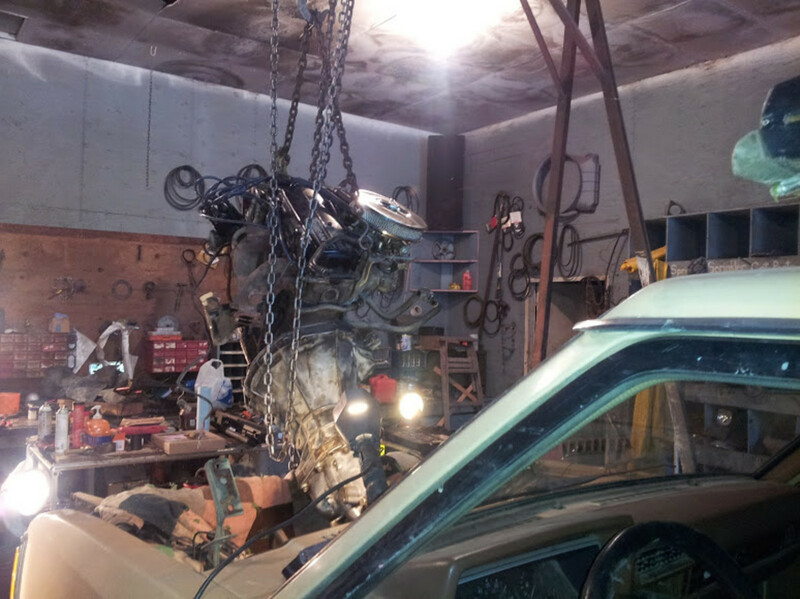 The engine and transmission must come out to get access to the clutch. 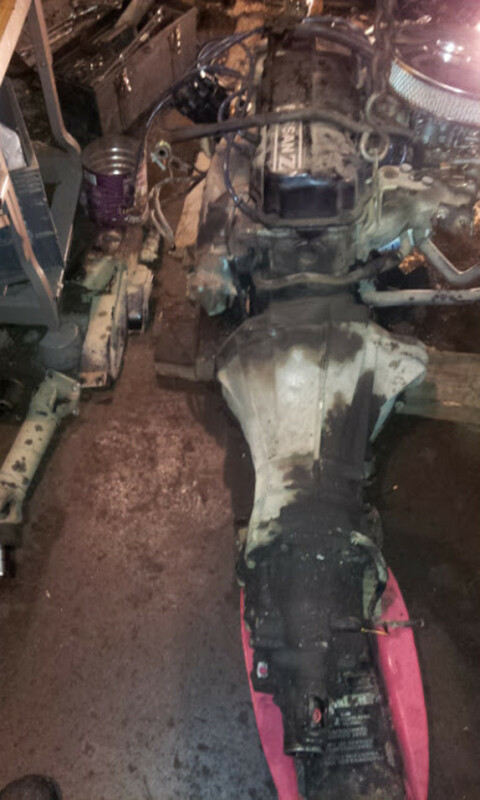 What didn't need to be removed were the drivelines, transfer case, and all the mounts. Remove the hood: 4 12mm bolts hold the hood to the hinges. Protect the hood and your windshield with a blanket or pad. 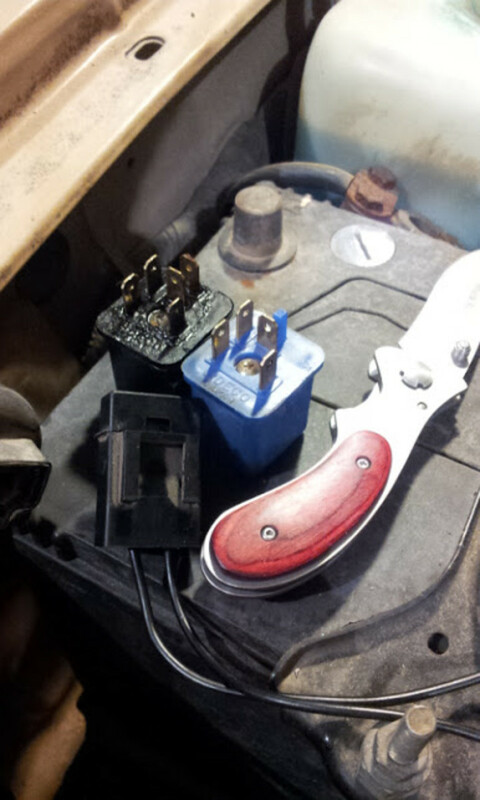 Loosen these 4 bolts and then with an assistant holding open the hood, remove the bolts and set the hood aside. Drain the coolant from the radiator and engine. There is a petcock at the bottom of the radiator on the drivers side. To ease reaching it, remove the fan shroud first. Do this by popping out the four upholstery tabs that hold on the lower metal portion of the shroud to the plastic upper portion. Once the tabs are removed, the lower shroud pulls out easily. Then using a 10mm wrench or large phillips screwdriver, remove the 4 screws holding on the plastic portion of the fan shroud. If you don't want to make a big mess when draining the coolant, remove the font skid plate first. Remove the front skid plate. There are six 10mm fender-bolts holding the plate in place. 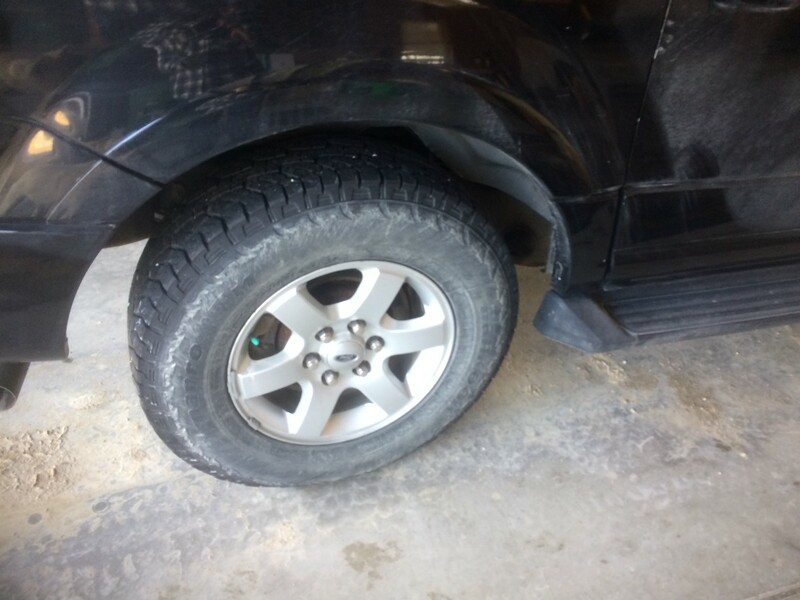 Those furthest forward (near the bumper) need only to be loosened. 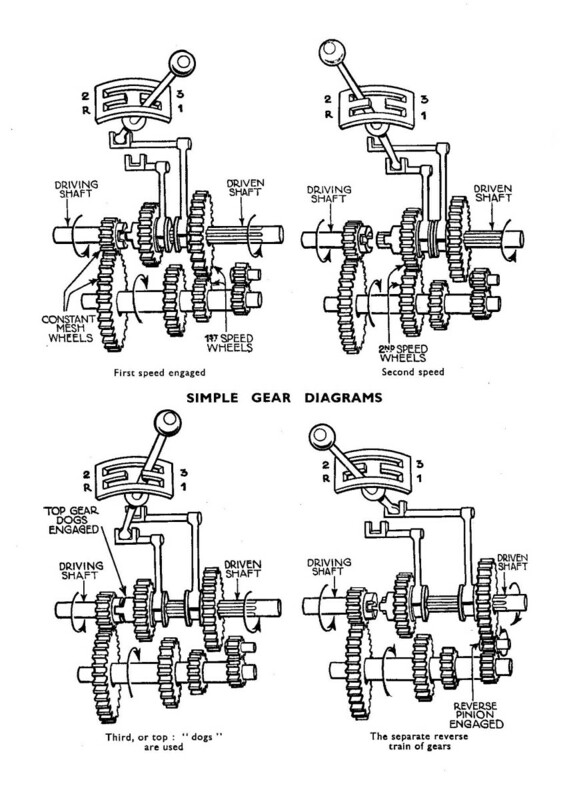 The three bolts on the differential cross member need to be removed. Remove the Radiator. Disconnect the upper and lower radiator hoses. Remove the four 10mm bolts holding in the radiator. Lift the radiator up slightly, them unhook it from the core support and lift it out. You'll need a tall hoist such as this chain hoist to do this as described. Drain the transmission: There is a plug near the bottom of the transmission that a 1/2" socket driver should fit. Remove the plug and drain all of the transmission fluid. Disconnect all the vacuum lines. If you have the stock carburetor still on the truck, label the vacuum lines from the carburetor to the emission controls mounted on the fender before disconnecting them. Also disconnect the vacuum lines to the charcoal filter on the drivers side of the truck. Disconnect the engine wiring. Unscrew the wires leading to the distributor. Also disconnect the starter and alternator wiring. The choke wire may also need to be disconnected. 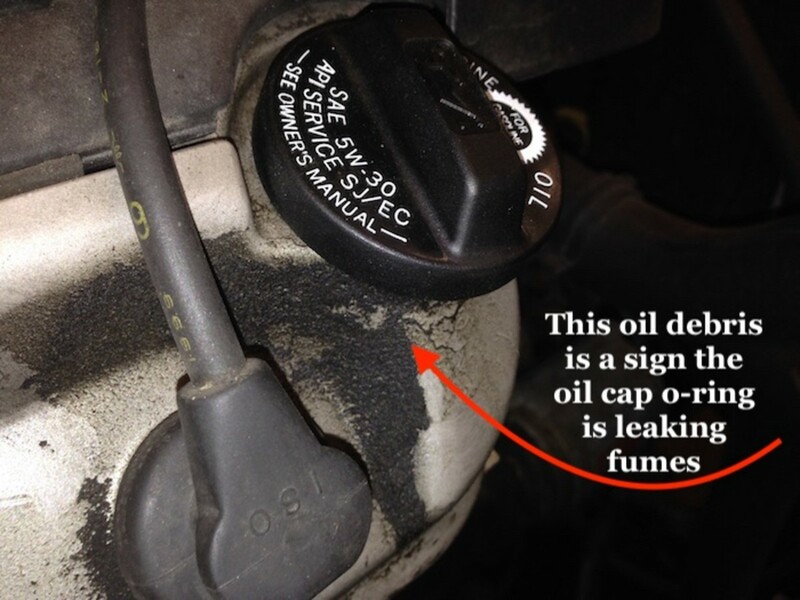 The oil pressure gauge (or light) should simply unplug. There should also be ground wires on either side of the engine to disconnect. Disconnect the power steering power steering pump and reservoir and tie it out of the way to prevent loss of hydraulic fluid. Remove the engine fan. You will need the space it takes up and with the radiator out of the way you can remove the grill and reach the bolts holding on the fan easily. Disconnect the fuel lines near the carburetor. There are two - the feed line and a slightly larger return line. Plug them to prevent dirt from getting in them. Remove the AC Compressor (if equipped) and tie it out of the way. Disconnect the two heater hoses on the passenger side of the engine near the firewall. Disconnect the throttle cable at the carburetor. 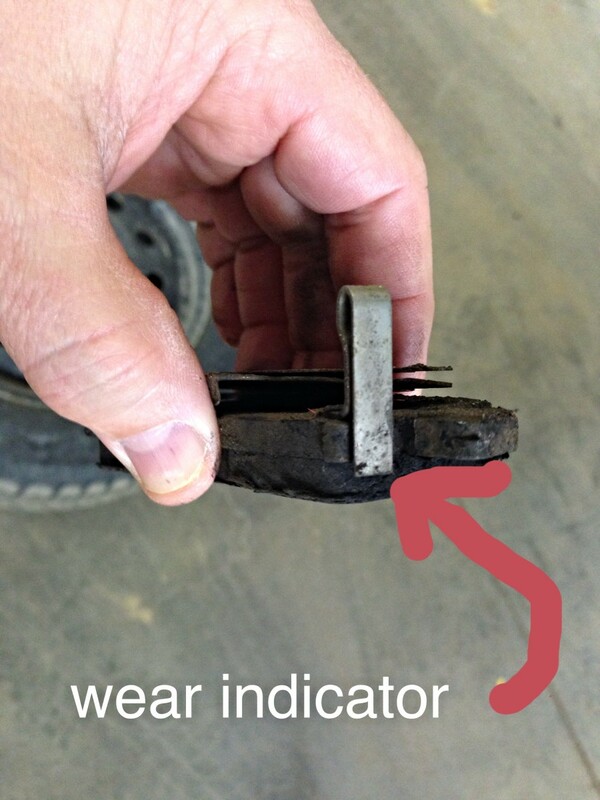 Disconnect the ignition coil wires and mark which coil they go to. DO NOT disconnect any wiring from the distributor cap! Disconnect the battery. 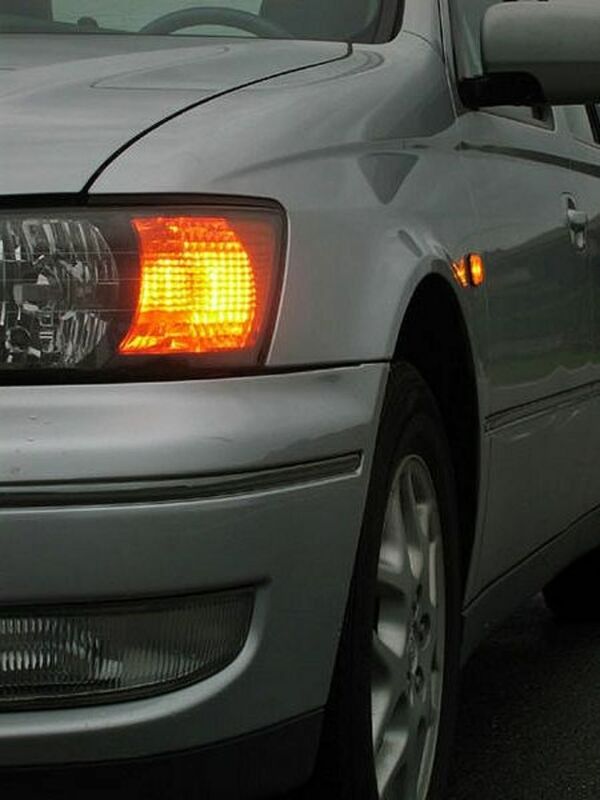 This is a good time to add those relays for off-road lights! Differential down but you don't need to pull it out completely. Remove the front differential. 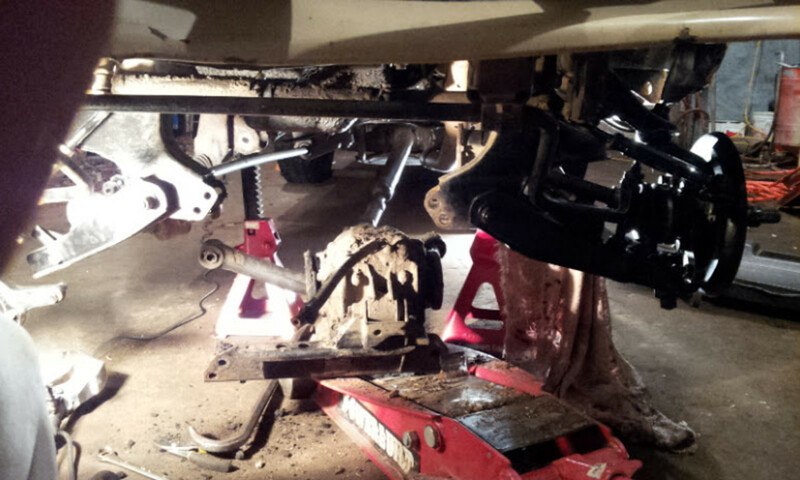 Remove the six front drive axle bolts on either side of the differential using a 12mm wrench. 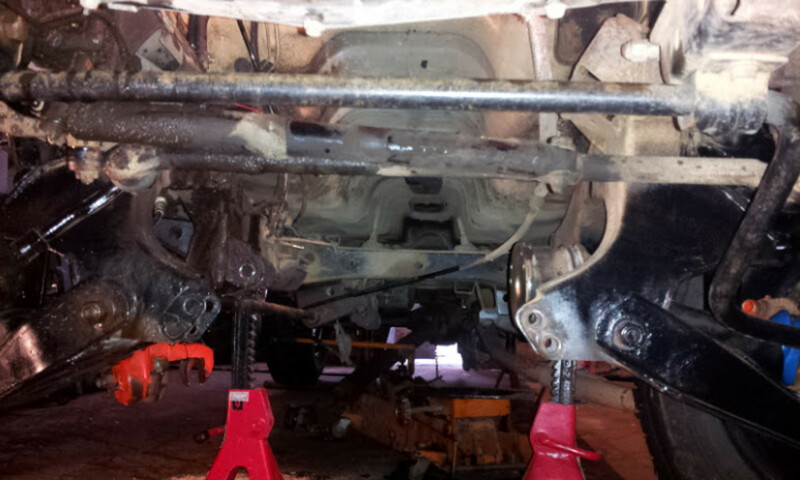 Then remove the four bolts on the front crossmember and the two bolts on the rear differential crossmember. Lower the differential but do not let the slip yoke on the driveline pull completely out. There is also a vacuum line on the differential that may need to be removed. 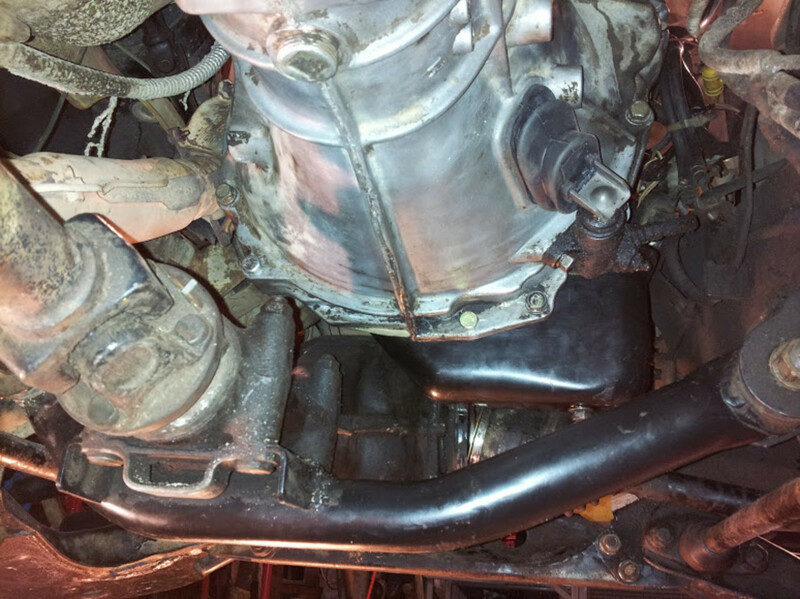 Disconnect the front exhaust pipe at the exhaust manifold. There is a heat shield around the three bolts securing the pipe which should be removed first. 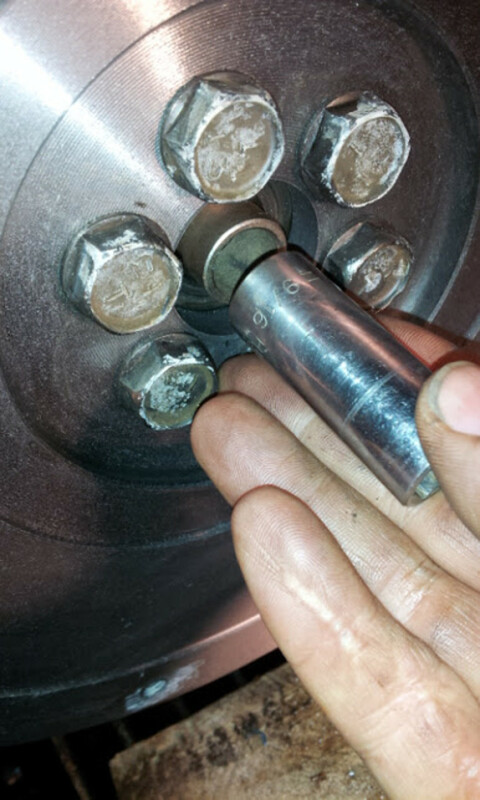 Remove the drivers-side wheel liner to get easier access to these bolts. 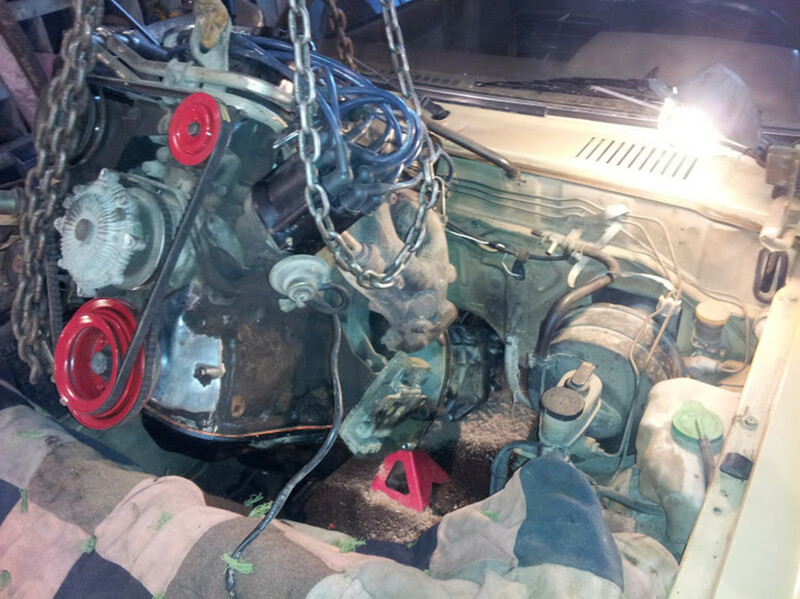 Remove the hydraulic clutch operating cylinder from the transmission bell housing and tie it out of the way. Disconnect the reverse and overdrive switch light wires from the transmission. 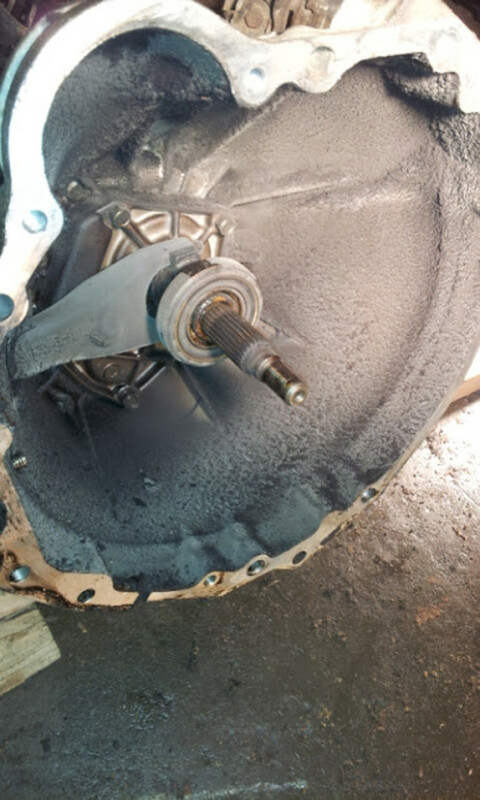 There is a vacuum line above the output shaft of the transmission that should also be disconnected. Unbolt the transmission from the transmission cross member pad. Remove the two 19mm (if memory serves) nuts - the bolt heads are flattened and will hold themselves in place to remove these nuts. 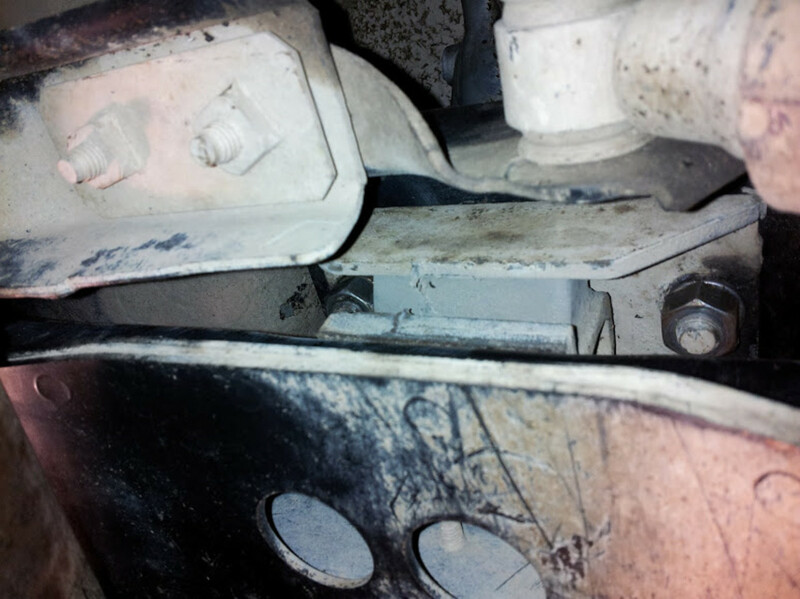 Two bolts hold the transmission to the crossmember support. From inside the truck, remove the shifter boots and pull the C-clip from the pin holding the shifter in the transmission. Remove the pin and carefully remove the shifter from the transmission. Remove the two center bolts from the engine mounts on either side of the engine. 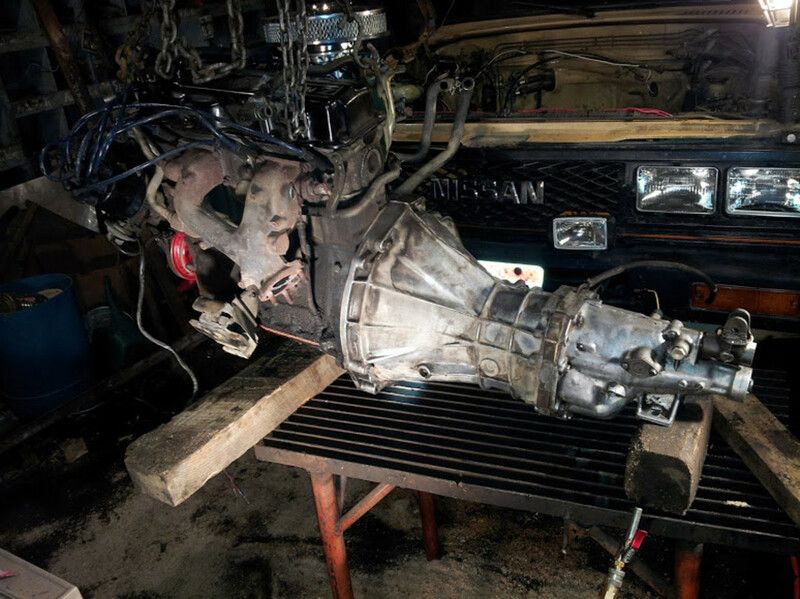 With a jack beneath supporting the transmission (use a block of wood), lift the engine slightly and pull it forward to the core support. This should allow the transmission output shaft to be pulled out without removing the driveline. 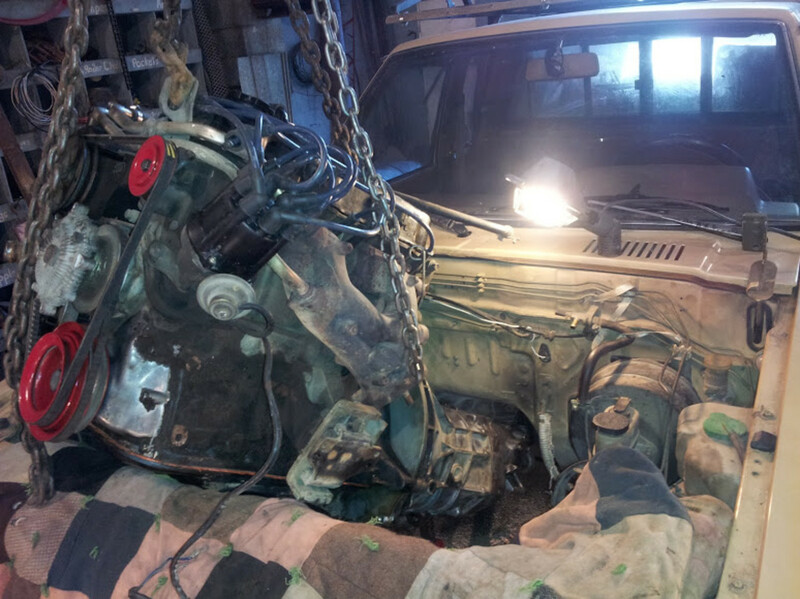 If not, remove the driveline from within the cab by removing the boot around the transfer case shift lever for access. 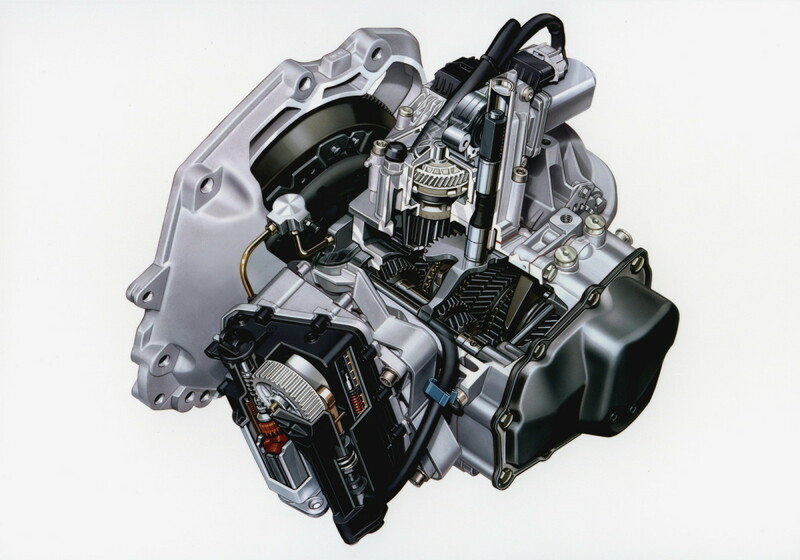 Carefully lift the engine out, tilting it upward as you allow the transmission to tilt down. Carefully and slowly work the assembly out. You may need to raise the truck to get enough angle to clear the core support with the engine. Set the assembly down gently and block beneath the oil pan to prevent crushing it. It can be done this way! 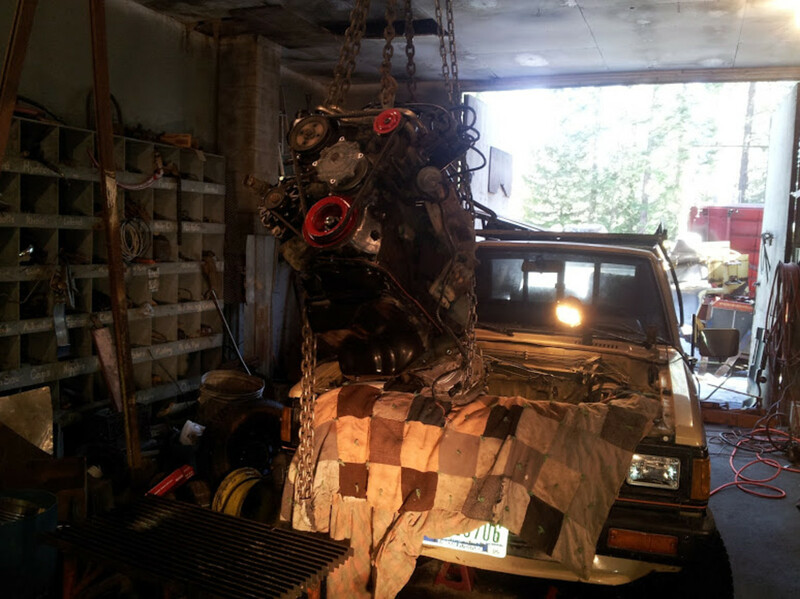 Support the engine on wooden blocks to keep from crushing the oil pan. Now that you have the assembly out of the truck, the hard work is done and you can get to the fun! Begin by ensuring that the engine is stable and will not move as you work. Block it in place and preferably leave the hoist attached. Remove the starter from the bell-housing if you did not leave it in the truck as part of the wiring harness. Remove the remaining bell-housing bolts, including those holding on the dust shield plate. 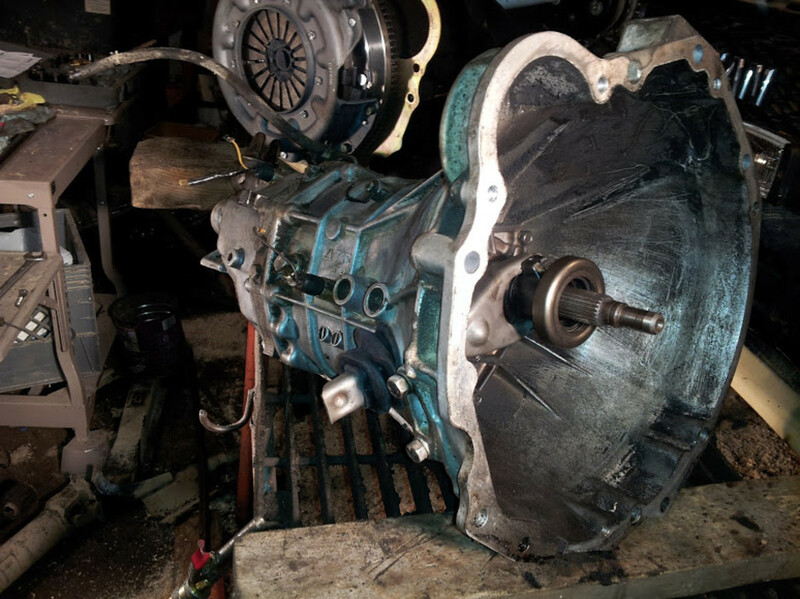 Without letting the transmission hang on the input shaft, slide it back and out of the clutch assembly. If you drained the fluid, it's not very heavy at this point and should slide out with a little "wiggling". Remove the clutch assembly. It doesn't matter if you mark the location of the clutch pressure plate to the flywheel - it can only go back on one way. 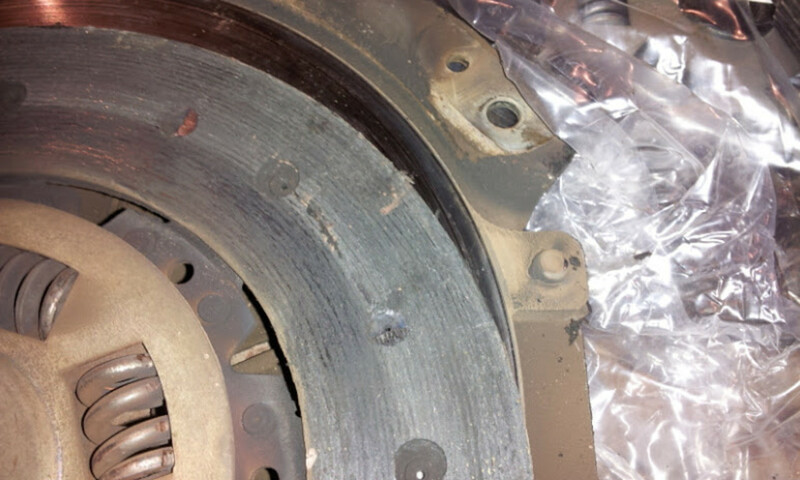 If there are grooves or discoloration on the flywheel, it should be replaced or machined. 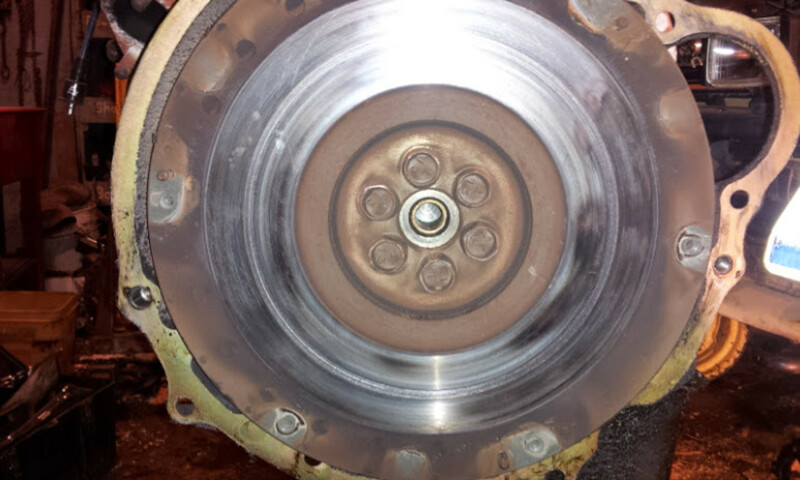 If you opt for machining, the friction surface of the flywheel is supposed to be raised and you will have to have all of the clutch pressure plate mounting holes and surface around the pins machined as well. I found that the Borg flywheel and clutch kit was less expensive than machining. Yes, it's made in China, but like Japan after WWII, China is tooling up and the quality is getting better. Borg Warner stands behind this kit. Inspect the pilot bushing. This is a brass oil-impregnated bushing. I replaced it because you cannot tell by sight the amount of wear it may have. I used this bolt to press it out by packing grease into the recess behind the bushing and hammering against it. 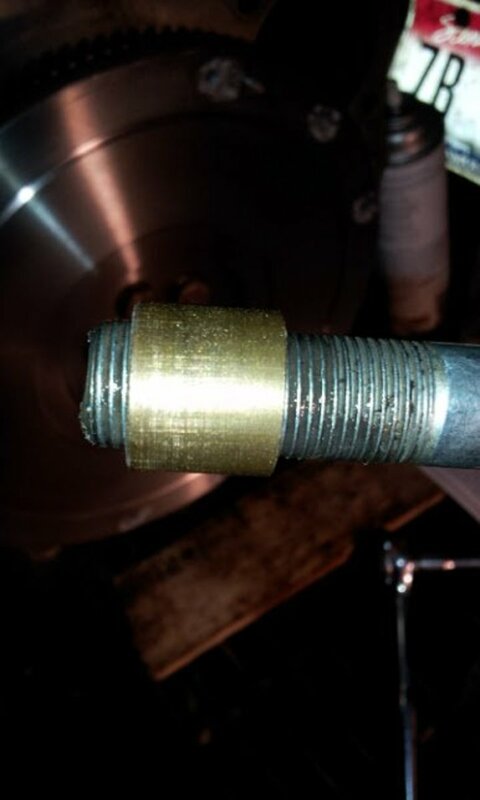 The pressure popped the bushing out onto the bolt as seen here. The new bushing was "pressed" in with a rubber mallet and socket. 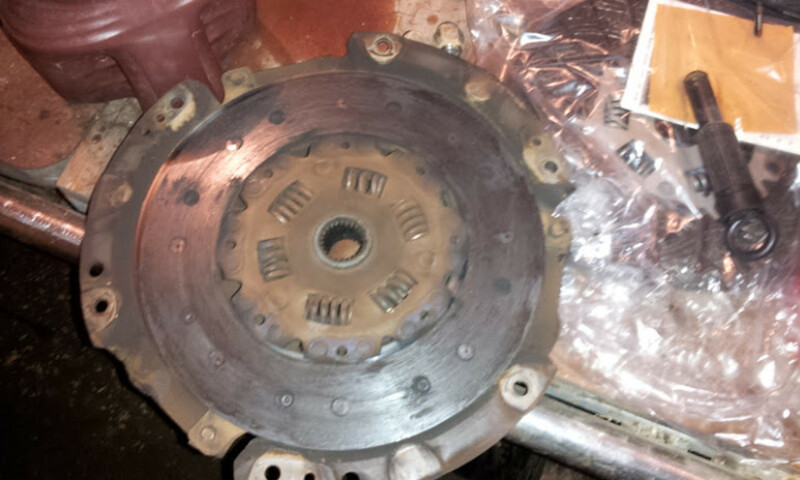 Reassemble the new clutch pressure plate to the flywheel with the new clutch disc between the two. Tighten all bolts slowly and evenly in a criss-cross pattern to ensure you don't warp the plate. 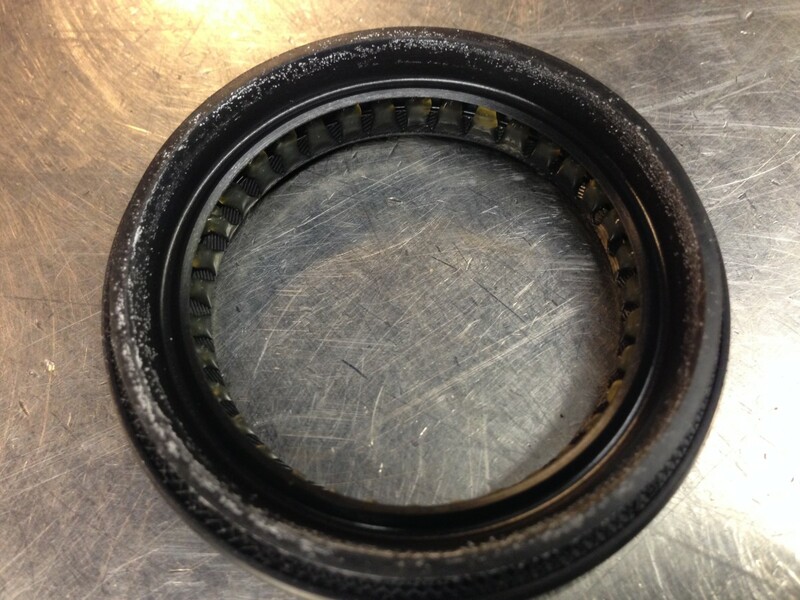 Keep your alignment tool (or socket) in the clutch to ensure proper alignment of all parts. Use a thread-lock compound (red preferably) on the bolts to prevent them from backing out over time. You may have noticed that the factory used Blue (medium strength) thread locking compound. 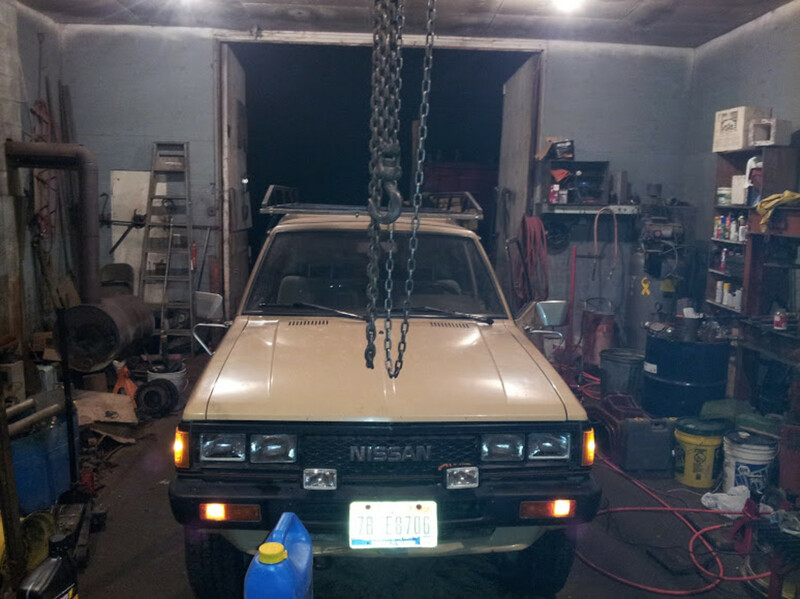 Replace the clutch release bearing at this time. There is a spring clip holding the lever arm to a ball in the bell-housing. Remove this carefully and keep track of it - your kit will not come with a replacement! Reassemble everything and go driving! 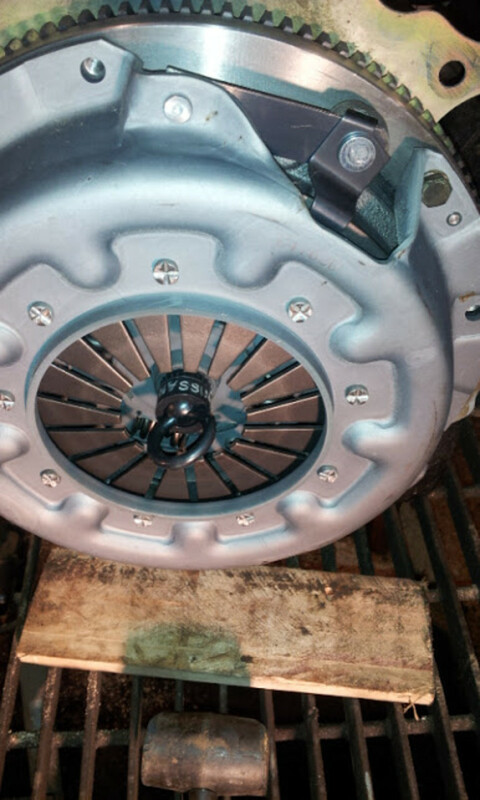 New flywheel. Don't forget to assemble with Thread Lock compound! 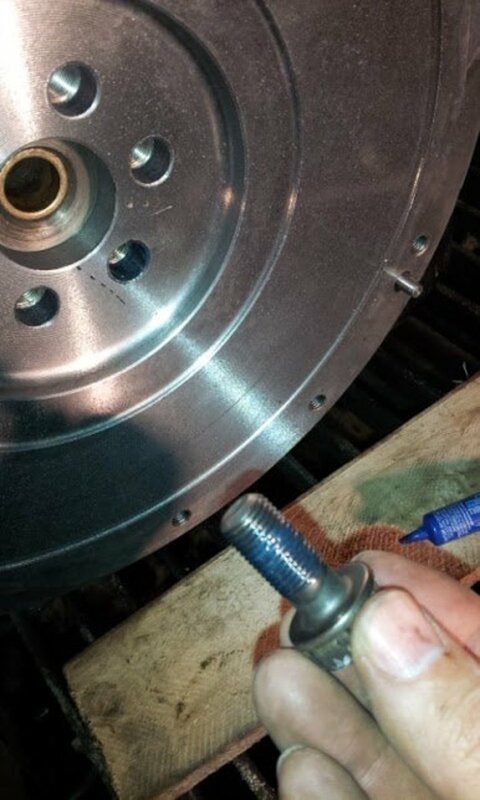 Pilot bushing on a bolt used to pop it out. Setting the new pilot bushing with my "press". Release bearing on transmission input shaft. All that powder around the bell-housing used to be my clutch friction disc. Back together and ready to go back into the truck! Dan, great instructions many thanks. I am looking at swaping gearbox and clutch on my 86. Do you have any insight on Trey´s comment below ? I am past that point the switch allows current to pass once pedal is depressed. The reason for being important is that the ECC computer uses this signal to deactivate the idle stop solenoid. I am still on the hunt for the rough idling. though. Unrelated qustion, I am having problems with an 85 4x4. I rebuilt the carb but idles rough. 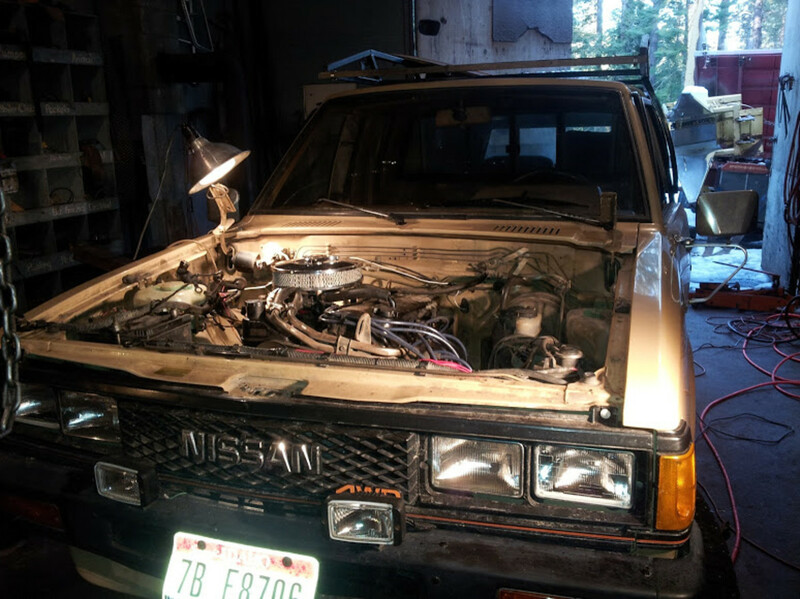 I am trying to restore the EEC related components: coolant sensor, neutral safety switch, and clutch pedal switch. However, I cannot find the clutch pedal switch the one in the truck looks more like a light switch and it does not work. I got one from the store but I doubt is the right one as it allows the truck to start in any position. 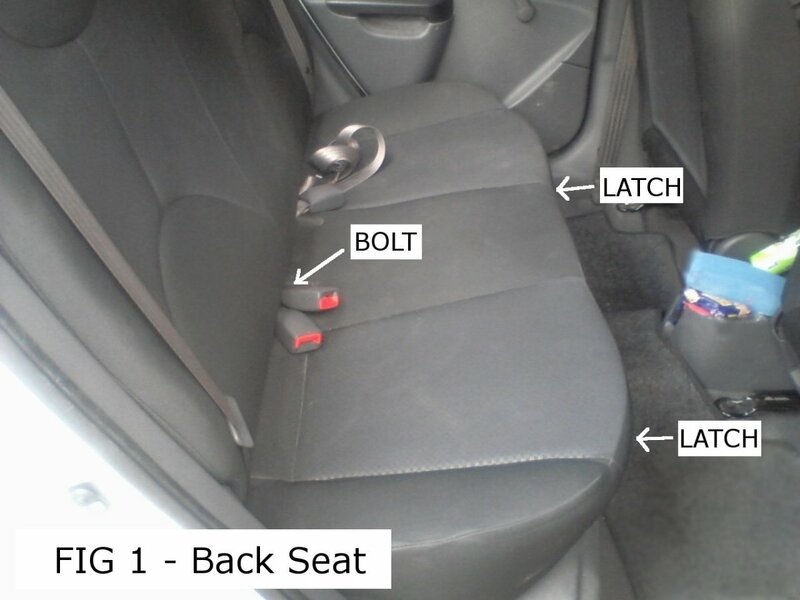 Do you have a picture of the clutch switch to share?